God Bless Small Town America! 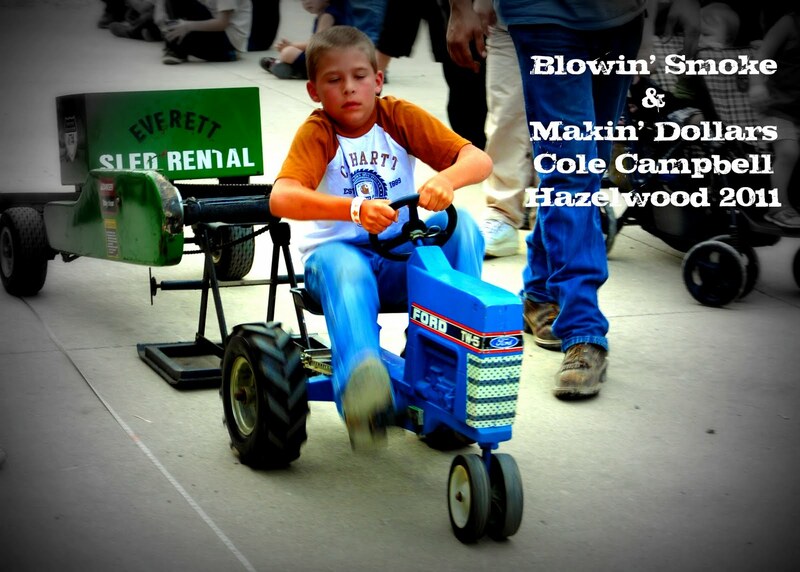 I love small town festivals! I love a good any volunteer fire department fish fry, a church fair, celebrations of a towns history - I am a lifetime attendee of The Fairland Fish Fry and from the time I was born till they quit having it I never missed a Boggstown Fair - last year for the first time I attended Fort Vallonia Days in Jackson County (awesome) but last night I loaded up the kids and we headed to Hazelwood, IN for the Hazelwood Fish Fry - and all I can say is "Hazelwood where have you been all my life?"! 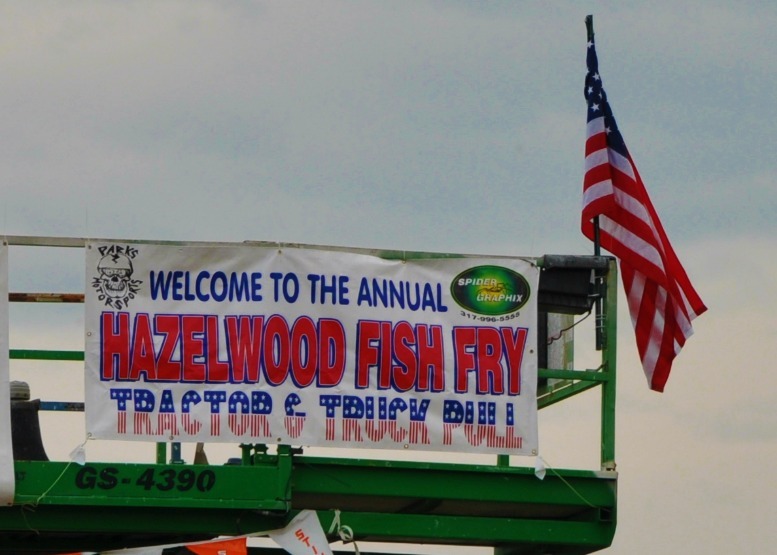 If you take all the things I love about festivals and county fairs (short of showing livestock) and roll them into one big ball, you have The Hazelwood Fish Fry - volunteer fire fighters frying fish (and the most amazing homemade onion rings ever), kiddie games (no creepy carnies but church groups raising money with a ring toss and ping pong balls to win a fish), elephant ears, a live local band, flea market booths, a pedal pull and then you throw in a tractor pull all out in the middle of nowhere, well it was just nothing but pure good American fun! Love these guys, they are always up for an adventure, all I say is "Hey do you guys wanna . ." and they all say "yes" before I can finish the sentence! where even on a Ford (he is a green man) he smoked'em! 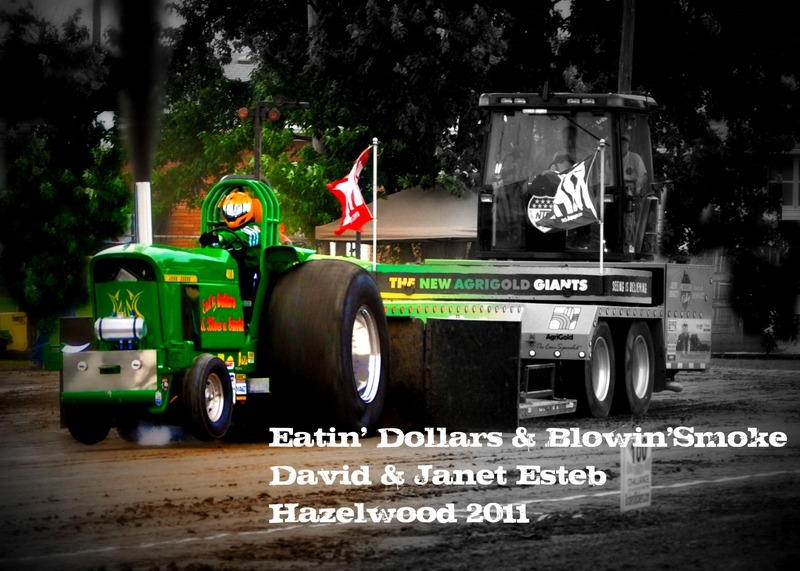 So I titled his pull Blowin' Smoke & Makin' Dollars! We had so much fun - I felt bad that Chris didn't get to go but truth is he was running anhydrous which made him just as happy to be working!﻿ Definatly on the calendar for next year! It's A GP 2 For 1!!!! Who can beat 2 for 1! So as you can tell by some of the pictures I have quite a few recipes marked in this cookbook - I tend to pair things up that sound good together and then make them both for a whole new meal! As I was marking recipes Bacon-Stuffed Burgers sounded good and the recipe for Hot German Potato Salad sounded like a perfect match! 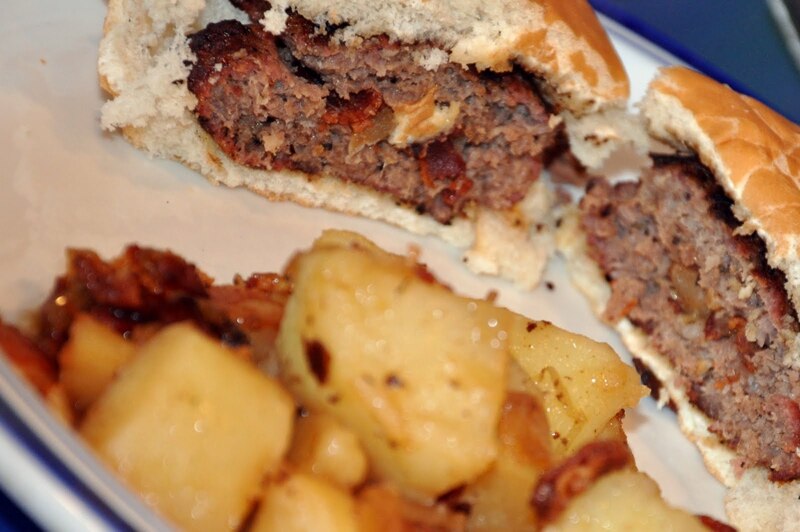 Who wouldn't want a burger that was made of ground beef, sausage, A-1 and some parm then stuffed with bacon and onion - really simple and quick! Put a spoonful of this Hot German Potato Salad beside it and it makes a perfect meal! I fried up enough bacon for both recipes then removed enough for the potato salad then put the onions in the bacon grease and sauteed them for the burgers! When a recipe calls for crispy crumbled bacon I always cut my bacon up into bite-sized pieces and fry them that way instead of cooking the whole stripes and then crumbling! I love it when recipes share a similar flavor together at a meal - plus I can do things once (like fry the bacon) for both recipes! While the whole potatoes for the potato salad boiled, I pattied out the burgers and "stuffed" them! I cut the potatoes up while the burgers were on the grill and made the dressing! It was a big hit - even My Cowgirl (who one might call a finicky eater-I just call her picky) even liked it - I am not a big fan of the flavor of vinegar but this was not overbearing like I was afraid it might be! And another 5 thumbs up for both (so that is a total of 10 thumbs!) 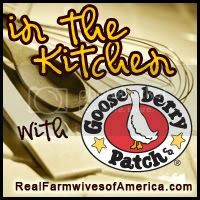 of these Gooseberry Patch recipes! - cube potatoes, mix with bacon and onions and pour dressing over and serve!